Roasted rhubarb crazy berry meringues showcase two of this month’s seasonal best ingredients. 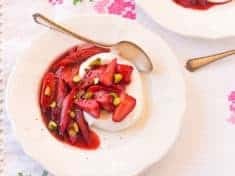 Spoon a bright red compote of tart rhubarb and juicy red strawberries on top of crunchy white meringues for this incredibly flavorful, just a little bit crazy, dessert. These meringues are vegan! Instead of the usual egg whites, they’re made with aquafaba, the water you drain from a can of chickpeas. Vegan meringues? Crazy? Stay with me here. I’m including a recipe for egg white meringues too–in case you were about to wander off. Coming from a pastry chef background, I had to test and compare the vegan and egg white meringues. Mind-blowing. If I didn’t tell you, I bet you couldn’t say which was which–the two different baked meringues are so close in looks, texture, and flavor. Actually, the vegan aquafaba ones are easier to make. Instead of being watchful not to overbeat egg whites, you whip the bejeezus out of aquafaba. Plus, there’s no separating whites from yolks, and no figuring out what to do with the yolks. 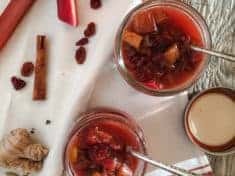 If you’ve ever cooked with rhubarb, you know that its color is rarely vivid red. You expect red, but you get dull pink. The cure is to roast the rhubarb in an orange scented raspberry sauce. Then, taking a cue from the Italian “crazy strawberry” dessert, fragola pazzo, spike the rhubarb raspberry sauce with pungent balsamic vinegar and freshly ground black pepper. Crazy good! Sweet and tart, meringue and fruit, crisp and soft—it’s a pleasing contrast. Kind of like Australia’s pavlova, except these meringues are baked until they’re crisp all the way through. Underneath the crazy rhubarb and berries, the meringues go all marshmallow-y creamy. For color and crunch, finish with a sprinkle of toasted pistachios. Be sure to plate your roasted rhubarb crazy berry meringues at the last minute, just before serving. 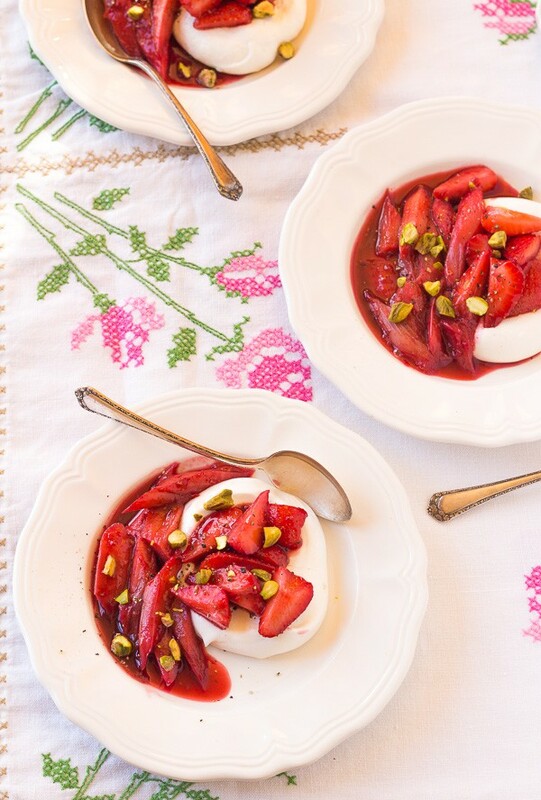 For a casual affair, let guests assemble their own: Put the meringues, rhubarb, strawberries, crazy sauce, and pistachios in separate bowls. Make one first, a demo, to show them how. They’ll love the final flourish of freshly ground pepper! Ideally, garbanzo beans for vegan meringues should not contain salt, but many brands do. Both Eden Organic and 365 Everyday Value (Whole Foods) have no salt added. If it’s all you can find, use the salted aquafaba. Meringues can be made several days ahead of time. They keep well in the open air in our dry mountain climate, but if it is humid where you are, store in an airtight container. If you eat dairy, you could gild the lily with a dollop of softly whipped cream. If you don’t want to make meringues, or if you’ve short on time, spoon this crazy rhubarb and berry compote over ice cream. Cookies would be nice on the side. You might also like this date-sweetened vegan Strawberry Ice Cream Pie with its stellar gluten-free almond crust. Be sure to check out The Vintage Mixer blog for Becky’s May listing of seasonal recipes. 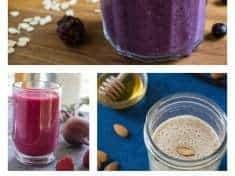 Becky also orchestrates a monthly recipe roundup featuring seasonal produce from a bevy of other bloggers–follow the links below to see how her list inspired us. We hope our recipes encourage you to get in the kitchen and cook something delicious—and seasonal! 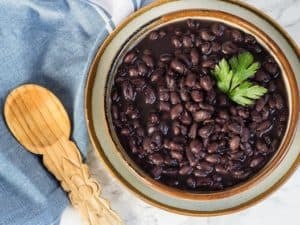 **If you make this recipe and love it, please consider leaving a blog post comment. Your comments help other readers learn more about the recipe. Crazy delicious vegan and gluten free dessert! Make the meringues and rhubarb the day ahead. 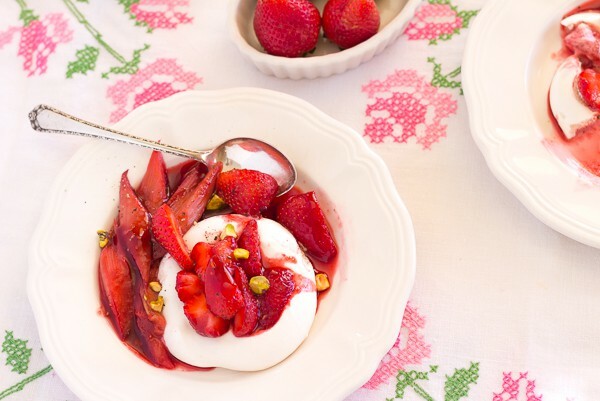 Stir the strawberries into the rhubarb compote just before serving. 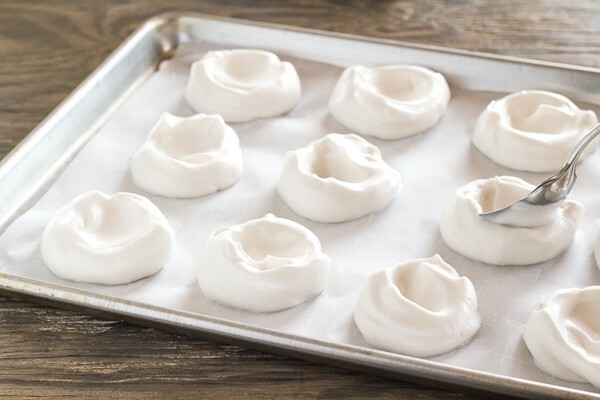 Vegan meringue recipe makes about 16 meringue nests, which is more than you need. The compote is enough for 6 to 8 servings. Egg white meringue recipe makes about 11 nests. Preheat oven to 200°F. Line 2 large baking sheets with parchment. Pour the bean liquid (aquafaba) through a strainer. With an electric mixer or stand mixer with whisk, whip the liquid with the cream of tartar until white and foamy, 2 to 5 minutes, less with a stand mixer. The liquid will double in volume. Continue whipping, adding the sugar 1 tablespoon at a time. Whip until the meringue forms stiff glossy peaks. This can take a while, 5 minutes or more, again depending on your mixer. Make a slurry with the arrowroot, vinegar, and vanilla. Add the slurry and whip some more. Scoop 1/3 cup mounds onto the parchment-covered baking sheet. (I use a #16 cookies scoop) Use the back of a spoon to hollow out the centers. Make the hollows deep, because they are not as deep when the meringues expand in the oven. Preheat oven to 375°F. Put the raspberries in a saucepan with the orange zest and juice. On low flame, cook just until the raspberries are hot and have broken down, but do not boil. Using a sieve, strain the juice from the seeds, pressing to get as much raspberry juice as you can. 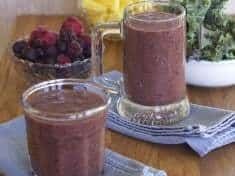 You should have about ¾ cup of thick raspberry juice. Set aside in a bowl. 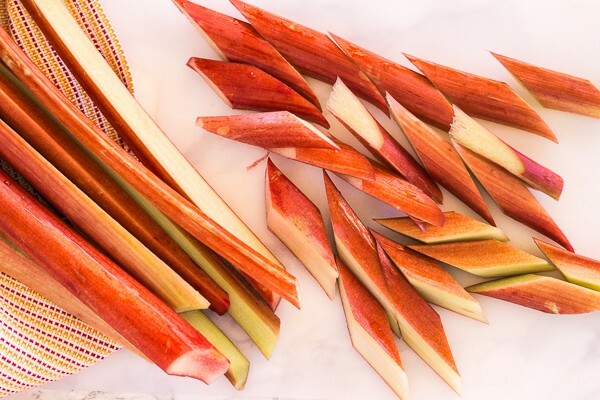 Cut the rhubarb stalks in half lengthwise, then cut on a sharp diagonal into 1-inch pieces. Stir the rhubarb and maple syrup into the raspberry sauce. Transfer to a 9 x 13-inch casserole and bake until the rhubarb is just tender but still holding its shape, about 15 minutes. Resist the urge to bake longer--the fruit softens as it cools. Using a slotted spoon, carefully remove the rhubarb. Stir in the vanilla, balsamic vinegar, and several grinds of black pepper. Stir the strawberries into the raspberry sauce. Place meringues on plates. Spoon rhubarb to one side and strawberries into the center. Drizzle sauce around the plate. Sprinkle with pistachios and freshly ground black pepper. Preheat oven to 200°F. Line 2 large baking sheets with parchment. With an electric mixer or stand mixer with whisk, whip the egg whites with the cream of tartar until foamy. Add the cream of tartar and continue to beat until soft peaks form. Gradually sprinkle in the sugar, whipping until the whites form glossy, stiff peaks, 3 to 5 minutes. Be careful not to overbeat. Make a slurry with the arrowroot, vinegar, and vanilla. Add to the meringue and whip until incorporated. Scoop 1/3 cup mounds onto the parchment-covered baking sheet. (I use a #16 cookie scoop.) Use the back of a spoon to hollow out the centers. If you are comfortable with a pastry bag, you can pipe the meringue through a large star-shaped tip, and form nests—higher on the edges than the center. Ideally the garbanzo beans should not contain salt, but many brands do. Both Eden Organic and 365 Everyday Value (Whole Foods) have no salt added. If it’s all you can find, use the salted aquafaba. 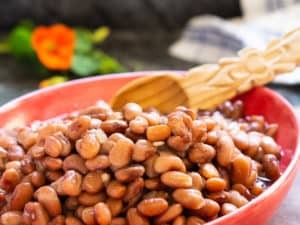 A 15-ounce can of garbanzo beans contains ½ to 3/4 cup aquafaba. Organic cane sugar is relatively coarse. To make it as fine as possible, give it a spin in the food processor. You can substitute superfine sugar, but regular sugar is generally not vegan. You can’t truly tell if the meringue is dry until it cools a minute. So, pull from the oven and gently lift a corner of one of the meringues. If it bends, return it to the oven for more baking time.